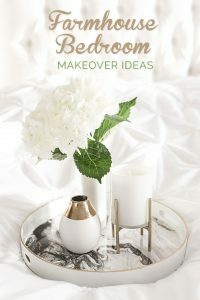 One of my goals this year is to update our Master Bedroom. It really needs it! The furniture in the room is a dark cherry, which really makes the room look darker since there is only one tall window in the bedroom. 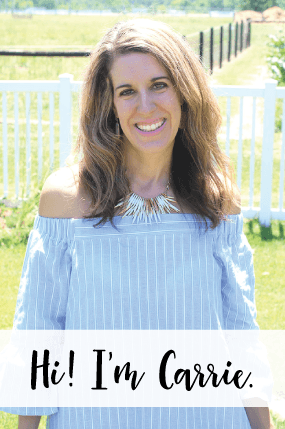 I’d love to brighten the space with white furniture and a light grey paint color… and LOTS of farmhouse style neutrals, textures and a touch of metallics here and there. 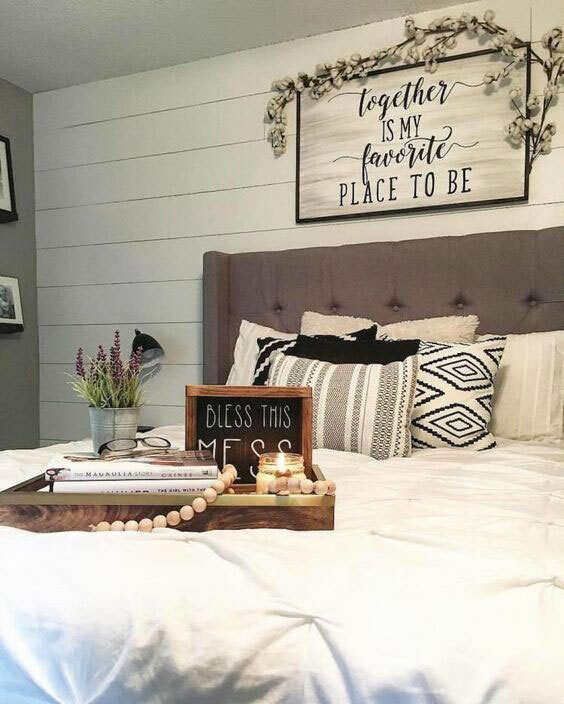 You can follow my Farmhouse Style Master Bedroom Pinboard HERE. I always like to paint a room first, before doing anything else in it. 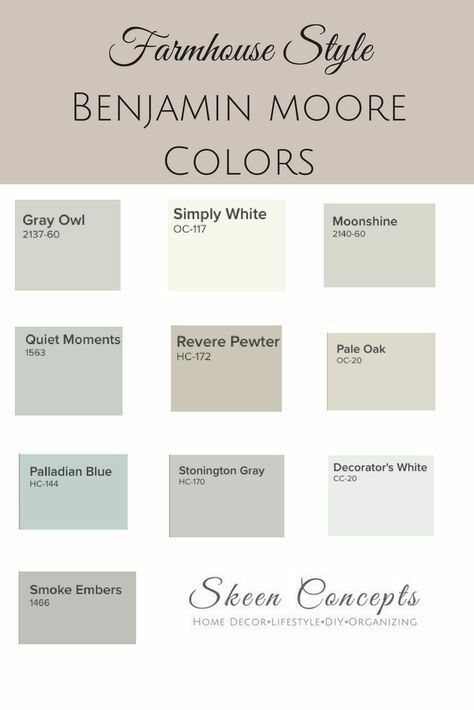 I want to paint the bedroom a soothing light gray color. As a start, I’ve been pinning paint swatches and rooms that are painted in that color. We’ll probably hire a professional painter to paint our master bedroom, the closet and then I’d also like to have my son’s room painted while the painter is here. I’m also considering having the master bathroom (I REALLY need to update the photos on this post!) painted in a much lighter yellow. When we painted it in 2015, the yellow was just a little brighter than I had wanted it to be and it has bugged me ever since. Don’t you just hate that? 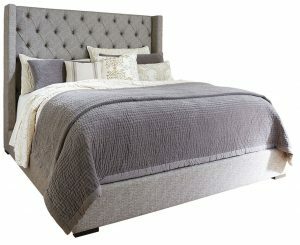 I really want a tufted headboard for our new bed. 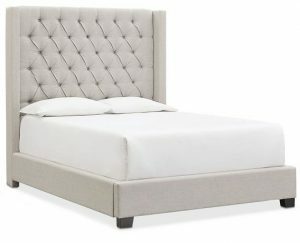 This headboard is from Arhaus and is a little pricey, but I’ve found some more affordable options (see below). I like how a lot of the newer beds let you ‘tuck’ the comforter in and you don’t need a bedskirt. The bed on the left is from Macy’s and the bed on the right is from Ashley Furniture. These are both fairly affordable options. Brian and I have a queen sized bed right now and we want to move to a king sized bed for a little more room. Our current mattress is old and we’ll need a new mattress to fit the king bed. We really want to take a look at the sleep number mattresses to see how good they really are! If you have one, do you love it? Let me know! I want to go with all white bedding for the first time. I’m not sure where I’ll get the bedding at yet, but I really want to play with different textures. I’m all about the finishing touches. 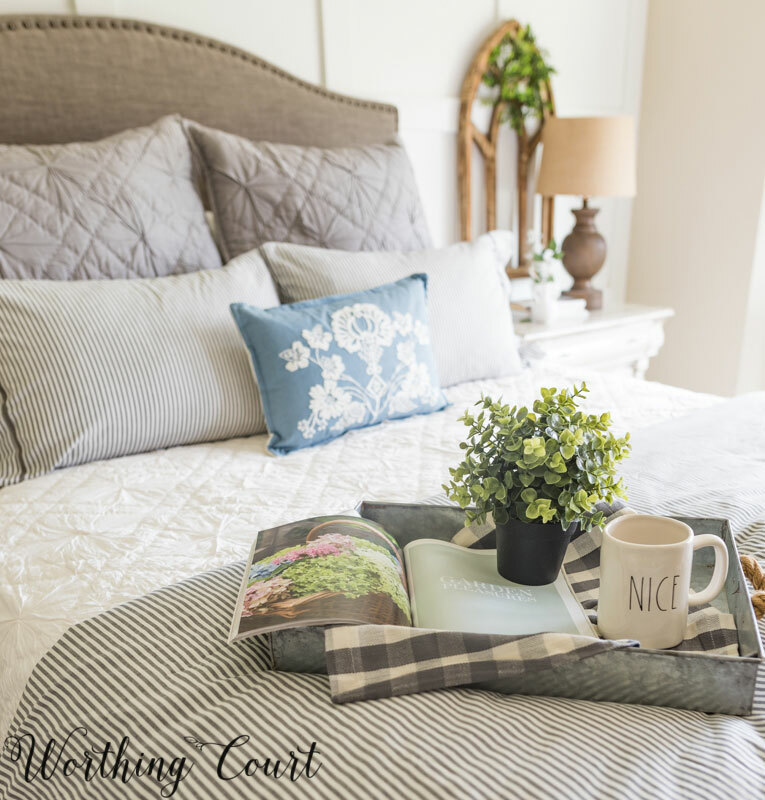 I just love the idea of setting a tray on the bed or on a bench in front of the bed, such as this one by Worthing Court. Another tray… with a wooden beaded garland, which y’all know I love those! I would love to place a bench in front of the bed, if we have room. 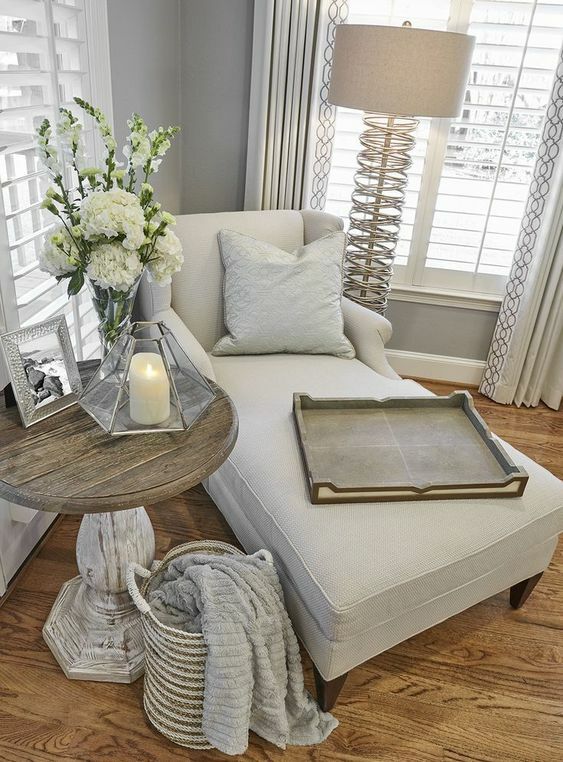 This upholstered bench from Wayfair is pictured in the very first photo in this post. 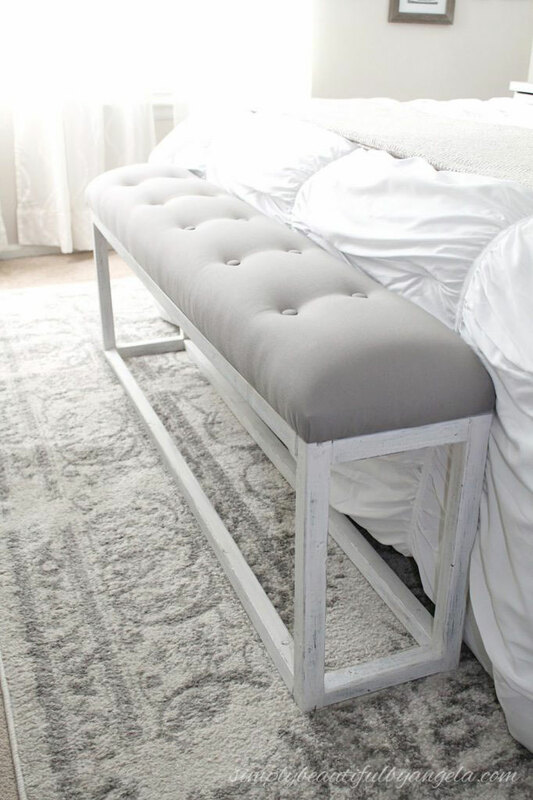 Or you could DIY a narrow tufted bench, such as this one by Simply Beautiful by Angela. This bench has a neutral leopard print on it and gold legs, which I just love! 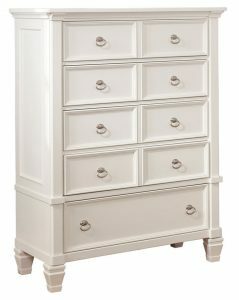 I really want white furniture in the bedroom and I like how this furniture has silver pull knobs, which would go great with the gray tufted headboard. 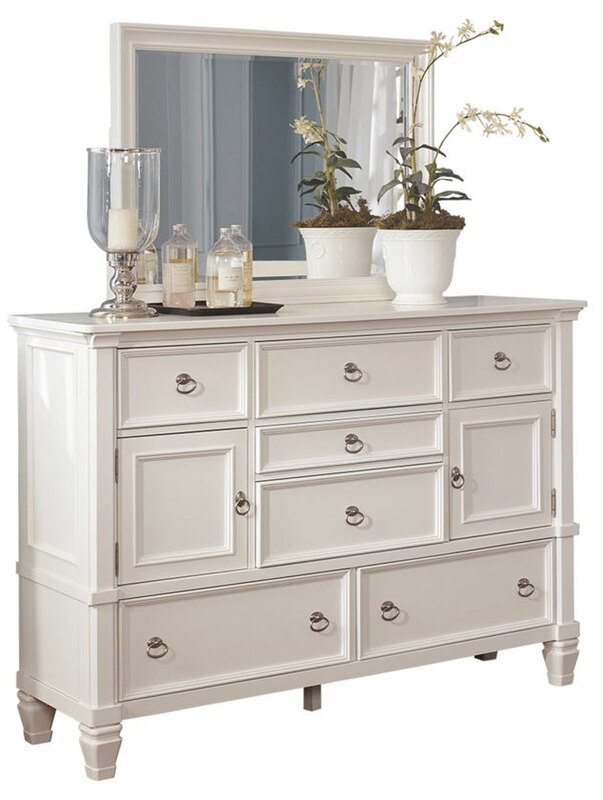 I’m not sure if I’d buy the mirror that goes with the dresser, because it’d be fun to pair a silver framed mirror with it from Hobby Lobby. 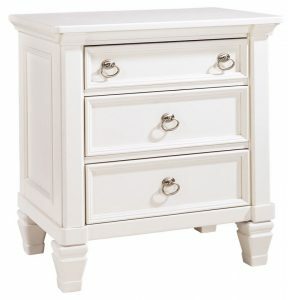 This is the chest of drawers and nightstands that go with this set. I’d like to update our closet. I want to go from metal to wood. We have a walkin closet that is a narrow hallway that runs along one wall of our master bedroom with a door on my side and a door on Brian’s side. I love the closet in the photo above, especially the wall on the left side. There is room to hang clothes on top and bottom and then an area for shoes or to stack sweaters, etc. in the middle. 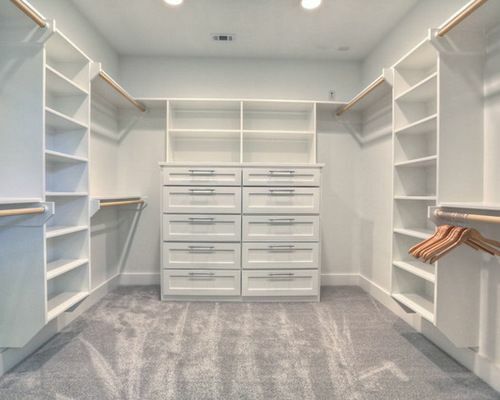 I really like the shoe storage on the side wall in this closet example. 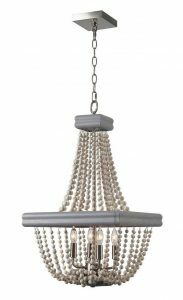 I’d like to get a rug runner for in the closet in a neutral leopard pattern and perhaps hang a couple of mini chandeliers in the space. 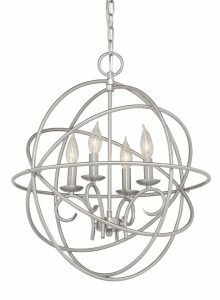 Right now we just have bulbs with a string! SO, so boring and unfinished! 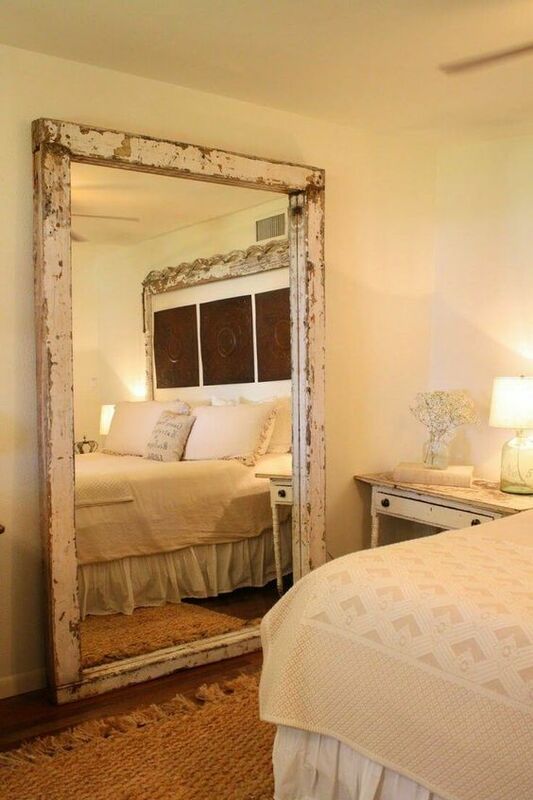 I’d LOVEEE to add a barn door to our bedroom. 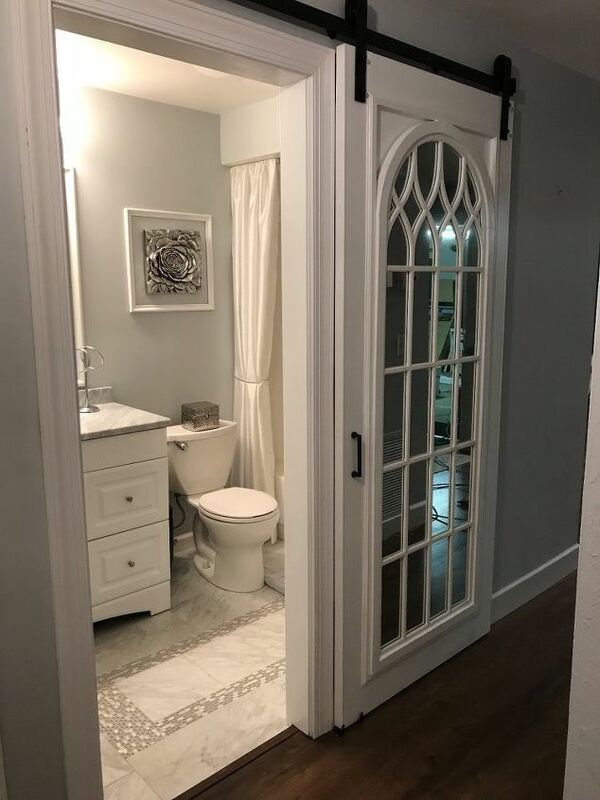 Either the bathroom space or the two doors that open up to the closet. But, I doubt we’d be able to make this work with how the room is laid out. It’d be SO pretty, though! 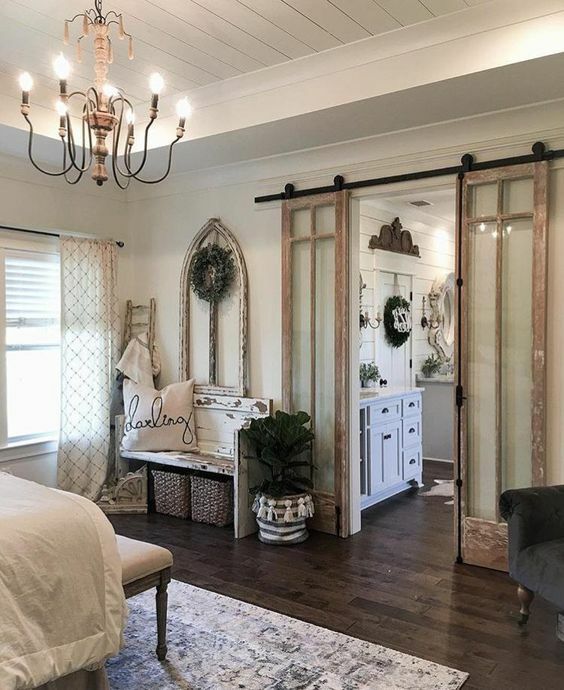 I found this cathedral barn door project on Hometalk. 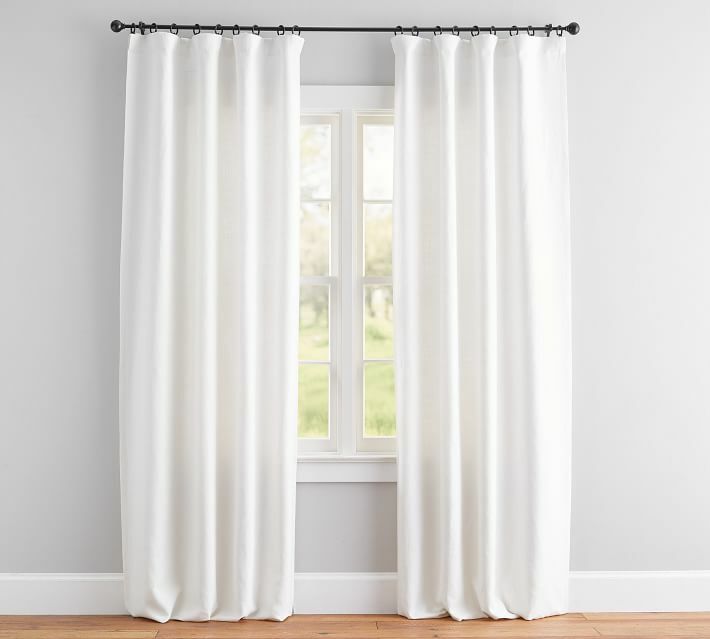 Pottery Barn is my go to for curtains and I love these plain, but bright and cheerful Belgian Flax Linen curtains. 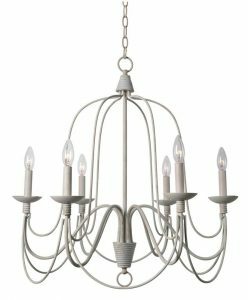 I really like the look of beaded chandeliers and this one has a gray frame, which would go well with the gray in the headboard. I’d love to carve out a little space in our room for a lounge chair, or just a big oversized chair where I could sit and read. Another idea I’d love to do, but I don’t think we’ll have the space for it. 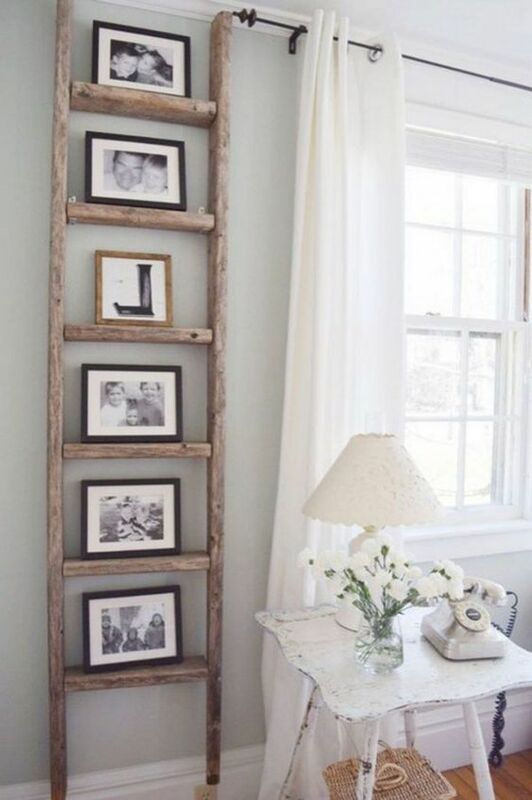 A blanket ladder would be a nice accent in a vacant corner in the room. 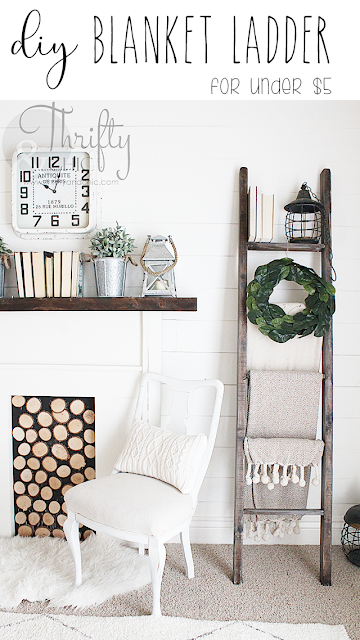 I love this $5 DIY ladder on Thrifty and Chic and how she decorated it. This ladder is nice with all of the frames set on it. This mirror is a beauty as well. 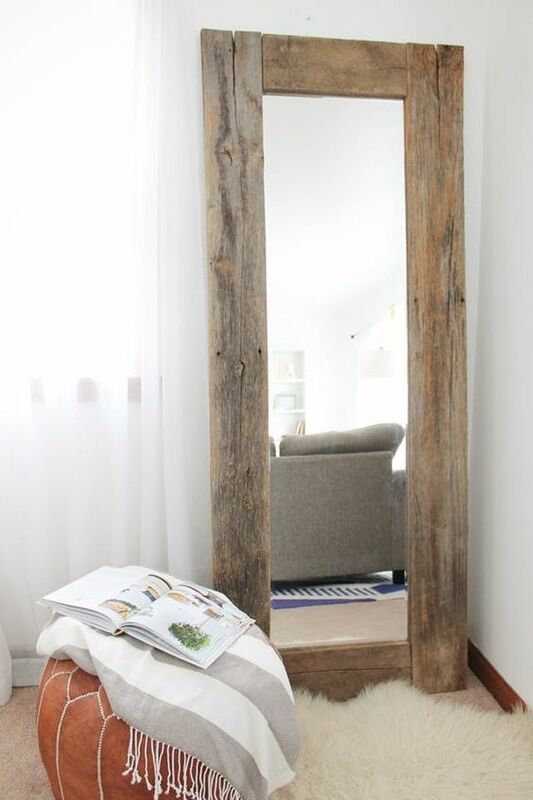 It’s a tad too big, but I love the rustic look.